As a Roman general paraded into the capital following a victorious battle, it was the custom to have a servant accompany him in the chariot doing two things simultaneously. He would hold a golden wreath above the champion's head while also whispering in his ear, "Memento mori!" The wreath was a symbol of the victor's marvelous success, while at the same time the whispered statement was a reminder of his limitations. "Memento mori" means, "Remember that you are mortal." Not a bad custom, really. Could we start that routine at celebrity awards shows? Everyone needs a "memento mori" moment. King Hezekiah had his at the prime of life. He had served as a good and capable king of Judah for 14 years when suddenly, at 39, he suffered a life-threatening illness. Upon deliverance and a divine promise of 15 more years of life, the good king wrote a poem about his experience. You can find it in Isaiah 38:9-20. I sit in awe before his poem as he praises God for the severe mercy of his traumatic experience. How are such trials for our benefit? What is it about them that make us better people? You'll want to join us at 10 this Sunday to mine this deep shaft of God's word. 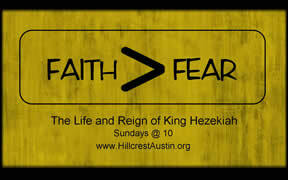 It's part of our series on King Hezekiah called "Faith>Fear." Catch up with our series online and bring a friend this week! It's not too late to join The Anchor Course! If you are exploring faith or trying to explain your faith to others, the Anchor Course will help. Consider it a sort of "tour guide" for our faith. Participants get my book for free. Meet me in the Adult Wing at 5:30pm this Sunday to get started. Get more information here.